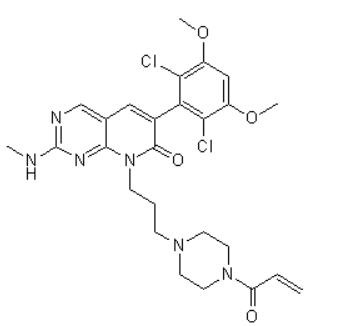 PRN-1371 is a covalent, irreversible, highly selective FGFR1, 2, 3 and 4 inhibitor. PRN1371 inhibits all four FGFR isoforms and blocks aberrant FGFR kinase signaling. This broad profile is suitable to treat many tumor types, including but not limited to urothelial, squamous lung, gastric and hepatocellular carcinoma. Storage Condition: Dry, dark and at 0 - 4 ℃ for short term (days to weeks) or -20 ℃ for long term (months to years). 0 - 4 oC for short term (days to weeks), or -20 oC for long term (months).